Konnichiwa, Ogenkidesuka? This is Iori writing. In Japan, we say Fall is the best season for arts and entertainment.This is probably because it is the time of year when art galleries and exhibits are organized. 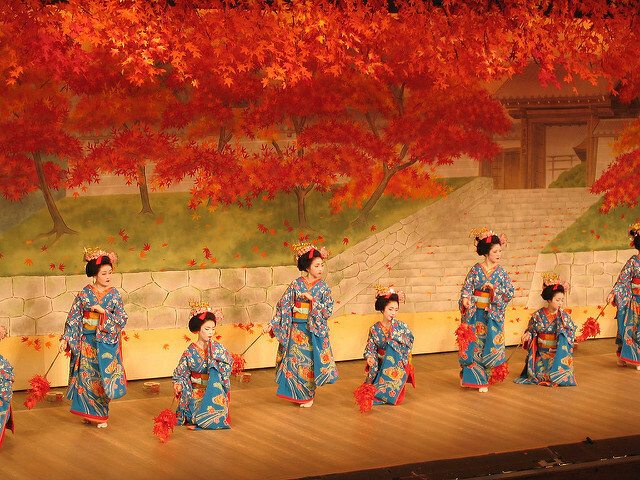 School festivals or cultural festivals are held in autumn, too. This time, let me write about my memory of this autumn. My daughter has started learning 'Nihon Buyo'(Japanese Traditional Dance) since this June by the cultural program of the town where we live. This program was organized to spread traditional Japanese culture to successors of the next-generations. This is a half-year program and the students take a part in the cultural festival in November. At first, my daughter asked me what the 'Nihon Buyo' is, so I showed it to her on the Youtube. Then she said "I want to do this!! 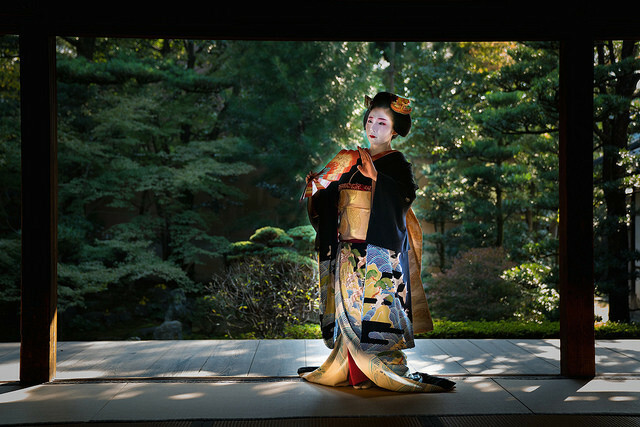 I want to dance like this in pretty kimono!!" It was the first time that she wants to learn something. So, she started to take the Japanese traditional dance class once a week. Usually, a teacher gives one-on-one lessons to a student, but there are some students in the class of this program. My daughter was the youngest student in the class and older girls were kind to her. She really enjoyed dancing. The way to dance of Nihon Buyo is very slow and hard to take rhythm. Besides, the six years old girl could concentrate on something for only 15 minuets! She always runs around the room and the Yukata (she wears Yukata at lessons) is opened in front....oh no... However, the teacher is very kind and knows how to catch children's interesting. She teaches them how to sit, bow and walk in correct manner before dance. My daughter gradually came to like dancing. Finally, the day has come. Kids got dressed in Kimono, put on makeup and done their pretty hair. 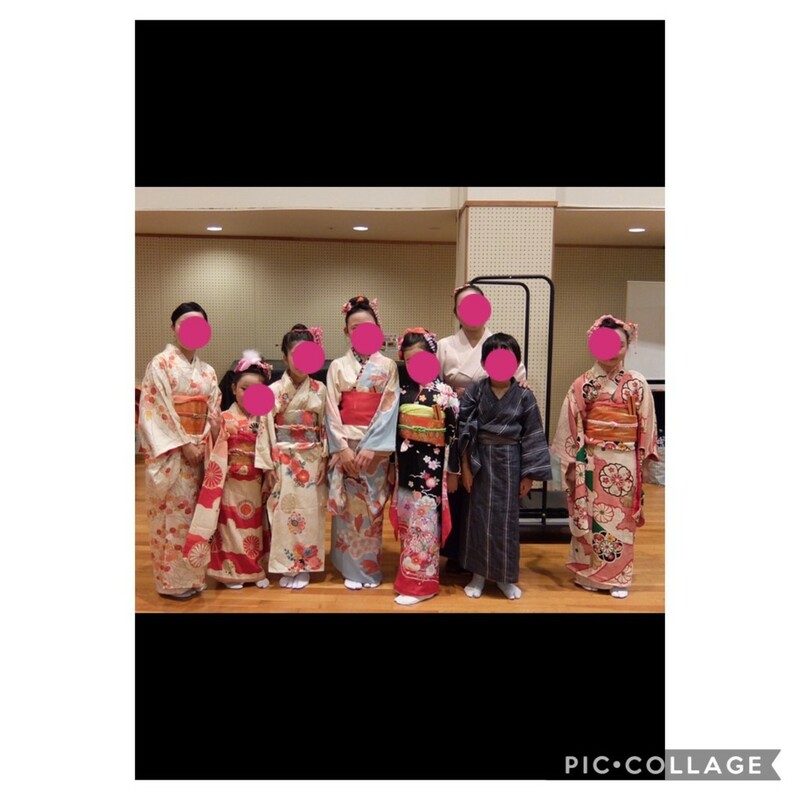 They looked so excited in pretty kimono because they usually wear Yukata at lessons. 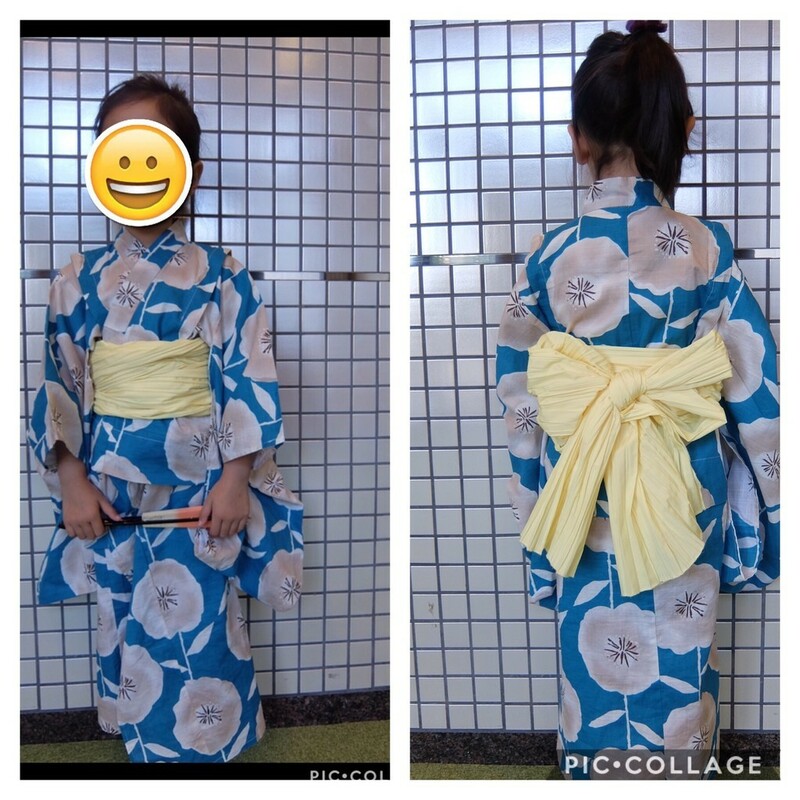 My daughter wore a pre-tied Obi, which I used for my 7 years old child's celebration. It is easy to tie and looks gorgeous! Of course, she ran, ate and jumped in kimono though, it was easy to re-tie. The stage was large. She has never stood on such a big stage. Lots of people were sitting in front of her and looking at her. She must got nervous in such occasion. My heart was beating fast, too. However, she did very good. Their stage was over, and I was relieved very much. All kid's dances were so cute. Their teachers also danced and that was wonderful!! It was too bad that taking pictures was prohibited. There are two more lessons in this program. She keeps dancing at home almost everyday and I am happy that she likes it. 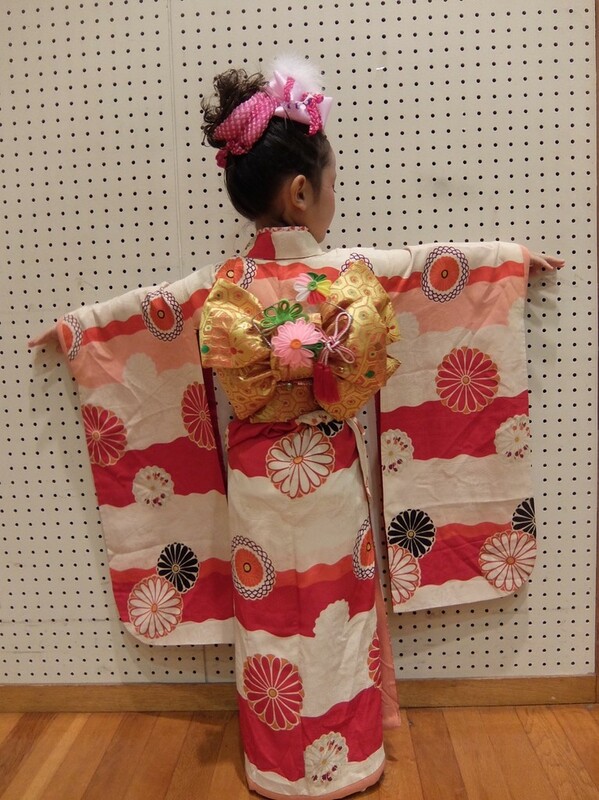 I saw some dancers wore Susohiki-kimono at the stage. The way to dance with the bottom hem trailing on the the floor was beautiful. 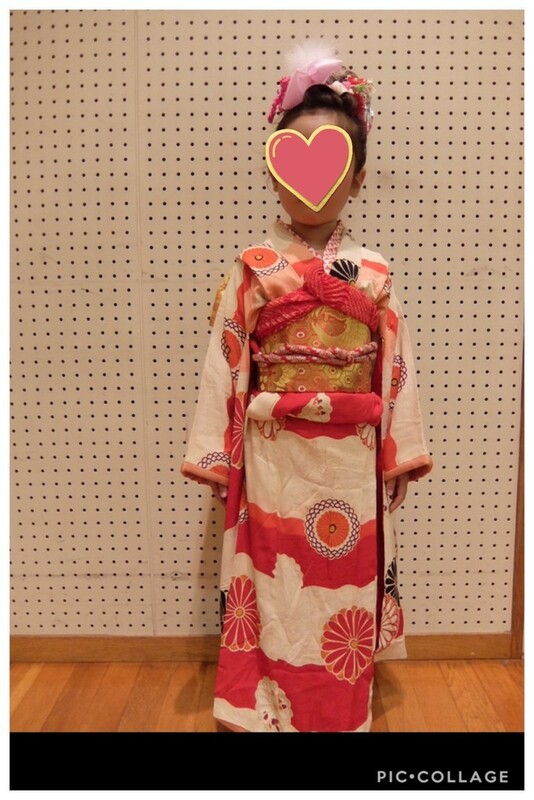 I introduce some Susohiki Kimono , gorgeous Obi and accessories. Vintage Kimonos and obi are also good for display!